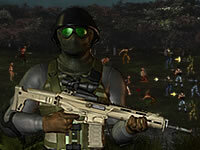 Description: Pixel Swat Zombie Survival is a game of shooting zombies. This game will bring thrill and excitement to the players with the confrontation with the zombies. You must collect all the items at each level while killing zombies and undead creatures. If you are killed by them, the game is over. Can you defeat all these evil creatures? Can you prove your own ability through each level? Join the game and play with friends.